The Vjosë or Aoös (Albanian: Vjosë ; Greek: Αώος,Vjosa; Aromanian: Băiasa) is a river in northwestern Greece and southwestern Albania. Its total length is about 272 kilometres (169 mi), of which the first 80 kilometres (50 mi) are in Greece, and the remaining 192 kilometres (119 mi) are in Albania. It is fed by several tributaries, such as the Voidomatis, Sarantaporos, Drino and Shushicë. The Aoös' source is in Greece, specifically in the Pindus mountains in Epirus, near the village of Vovousa. An artificial lake has been constructed at an altitude of 1350 meters, and there is a hydroelectric dam in place since 1987. 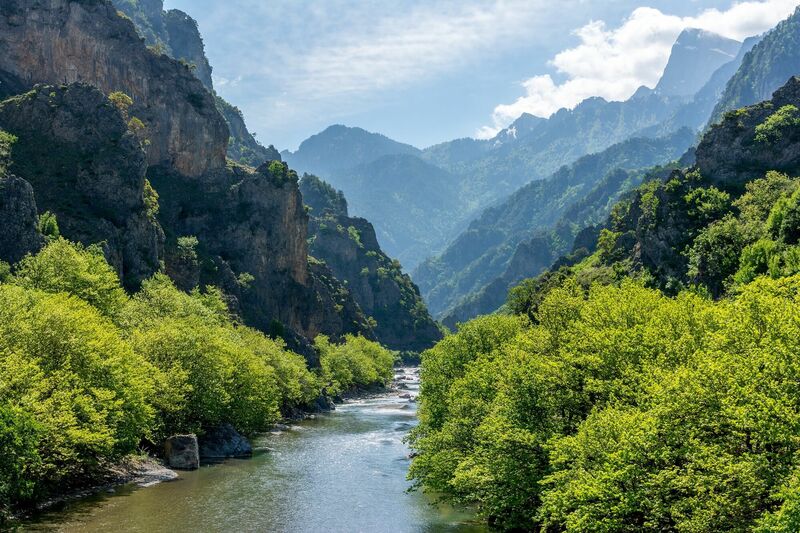 It flows through the Vikos–Aoös National Park, where it forms towering canyons and then flows through the town of Konitsa, where it is joined by the Voidomatis. It enters Albania near Çarshovë, where it is joined by the Sarantaporos. and then continues northwest through Përmet, Këlcyrë, Tepelenë (where it is joined by the Drino), Memaliaj, Selenicë and Novoselë. It then flows into the Adriatic Sea, northwest of Vlorë. The river is known by a number of different names. In antiquity it was called Aoös (Ἄωος, Ἀῶος, Ἀῷος) in Greek, and Aous in Latin. In Albania it is called Vjosë or Vjosa, while in Greece it is known by its ancient name (Αώος in modern orthography), as well as Vovousa (Βοβούσα) or Aias (Αίας, Αἴας).